Para-para-paraaaaaa….Para-para-paraaaa. Donate-a-Book turns THREE today! We are through with the not-so-terrible twos. As we turn a magical three, we look back at the last three years! Thank you ALL for being the best type of book buddy : the one who shares the joy of reading! Like everyone else on the planet, we love getting presents for our birthday. 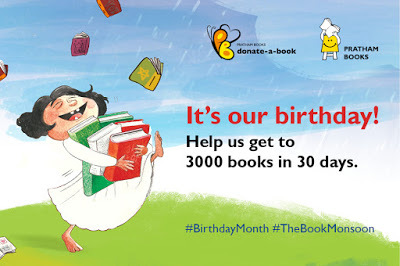 This birthday, we want to ask you to create #TheBookMonsoon! We want it to rain books, books and more books. Help us raise funds for 3000 books in 30 days! The best part – this birthday gift will be shared with thousand of children across the country. Children studying at pre-schools and non-formal centres run by Nipun in the slums of Delhi. Help ARHI kickstart a knowledge revolution with books in 8 community libraries located in Karbi Anglong and Morigaon districts of Assam. Add books to the only accessible library that exists in this rural part of Valsad, Gujarat. Add learning resources to the centres Pratigya is running in remote villages of Jharkhand. Help expand this existing library in Jaipur so that the student to book ratio in it increases. By donating 2 library kits, you can ensure that ‘library hour’ is a possibility for the kids at Sudhanikethan Education Society, Bengaluru, Karnataka. Support Savera Foundation’s project to start libraries in government schools in the remote district of Giridh, Jharkhand. Send some book love to this village library in Vizianagaram, Andhra Pradesh. Bring the joy of reading to a village library in Kundagol and several other Gram Panchayat libraries in Karnataka. Help Let’s Open a Book to encourage reading habits among children from disadvantaged backgrounds in Spiti Valley. Gift the joy of reading to 250 girls from rural and urban regions of Ajmer, Rajasthan. Support Joshi Trust’s reading program in tribal and rural schools across Raigad District in Maharashtra. Umri Foundation aims to setup at least 5 reading centers in government schools in rural Karnataka. Shower some book love on St. Theresa’s Primary School in Erode. Help these children from 2 primary schools in Hyderabad become readers for life. Adarsha Seva believes that a child without education is like a bird without wings. Help these children soar high. Shape the future of these young minds supported by Varitra Foundation. Support the India Reserve Battalion, Munirabad in their endeavour to build a reading room for the children of policemen. These little superheroes from Chennai need a library of books to cultivate their reading habit. Swatantra Talim is organizing the SwaKhoj Awards across Uttar Pradesh to ignite children’s creativity and innovative thinking. 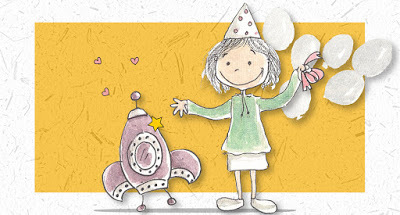 Help them gift books to the children at the event. Enable the kids studying at this budget private schools in Delhi to become readers for life. Synodical Board of Social Services require books for their remedial centres/informal schools in villages in Amritsar district. Help Nayan open a library on wheels to cultivate the love of reading among children in Jaipur. Bharti Global Education Society’s rural reading program that will be accessible to 150 kids in Faridabad, Haryana. Deepalaya wants to equip 10 learning centers located in slums of Delhi and Uttar Pradesh with books. A donation of Rs.200 = 1 financial literacy book pack for a low-income school in India. Encourage the reading habit in this Government Higher Secondary School located in Trichy, Tamil Nadu. Help Gabriel Project Charitable Trust start libraries in 8 government schools working with tribal children in Palghar, Maharashtra. Help Zindagi Foundation set up village libraries across Gopalganj district in Bihar. Equip this government school’s Reading Circles Project with English books to improve their reading skills. GSM Foundation wants to set up a community library that is accessible to kids who are dropouts or not enrolled in schools in Delhi. Donate books to this mobile library project that reaches 25 government schools and 2 lower budget private schools in Majuli, Assam. A class of students who want a library in their classroom in Chennai, Tamil Nadu. Let it rain books all across India.